Qosina offers an extensive line of pre-assembled extension lines available in a variety of configurations that are in stock and ready for immediate delivery. Qosina part # 33070 features a 3 way stopcock on one tube end and a male luer lock connector on the other. Complete with caps, this extension line has an overall length of 30 inches and is pre-coiled and taped for easy handling. 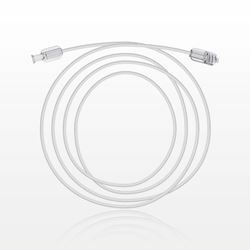 Extension lines provide flexibility while helping to simplify the design and prototyping phases of your project. Our sales team can assist you in building a custom configuration to meet your project requirements. Qosina offers an extensive line of pre-assembled extension lines available in a variety of configurations that are in stock and ready for immediate delivery. Qosina part # 33067 features a female luer lock connector on one tube end and a male luer lock connector on the other. Complete with a pinch clamp and vented luer lock caps, this extension line has an overall length of 14 inches and is pre-coiled and taped for easy handling. 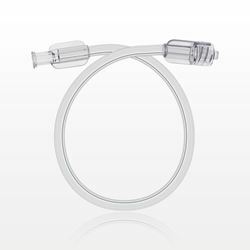 Extension lines provide flexibility while helping to simplify the design and prototyping phases of your project. Our sales team can assist you in building a custom configuration to meet your project requirements. Qosina offers an extensive line of pre-assembled extension lines available in a variety of configurations that are in stock and ready for immediate delivery. Qosina part # 33066 features a female luer lock connector on one tube end and a male luer lock connector on the other. Complete with a slide clamp and vented luer lock caps, this extension line has an overall length of 36 inches and is pre-coiled for easy handling. Extension lines provide flexibility while helping to simplify the design and prototyping phases of your project. Our sales team can assist you in building a custom configuration to meet your project requirements. Qosina offers an extensive line of pre-assembled extension lines available in a variety of configurations that are in stock and ready for immediate delivery. Qosina part # 33068 features a female luer lock connector on one tube end and a male luer lock connector on the other. Complete with a slide clamp and vented luer lock caps, this extension line has an overall length of 60 inches and is pre-coiled and taped for easy handling. Extension lines provide flexibility while helping to simplify the design and prototyping phases of your project. Our sales team can assist you in building a custom configuration to meet your project requirements. Qosina offers an extensive line of pre-assembled extension lines available in a variety of configurations that are in stock and ready for immediate delivery. 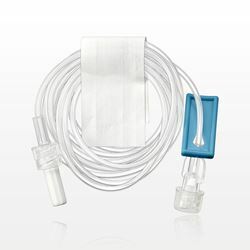 Qosina part # 33069 is 7 inches in length and features a hydrophobic filter, slide clamp, and female luer and male luer lock connections. 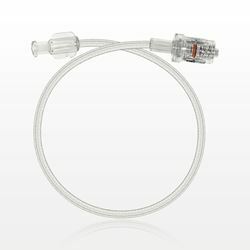 Equipped with vented caps, this extension line provides flexibility and additional capabilities to existing devices. Our sales team can assist you in building a custom configuration to meet your project requirements. 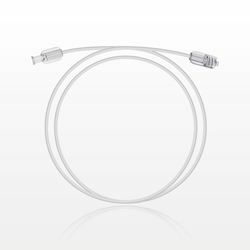 Qosina offers an extensive line of pre-assembled extension lines available in a variety of configurations that are in stock and ready for immediate delivery. Qosina part # 36225 is a bonded and braided polyurethane and nylon high pressure line which features a female luer lock and rotating male luer lock. With an overall length of 20 inches, this extension line can withstand pressures up to 1200 psi and provides flexibility while helping to simplify the design and prototyping phases of your project. Our sales team can assist you in building a custom configuration to meet your project requirements. Qosina offers an extensive line of pre-assembled extension lines available in a variety of configurations that are in stock and ready for immediate delivery. 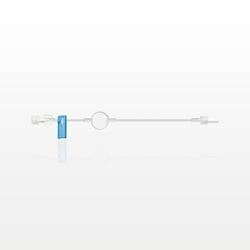 Qosina part # 36227 is a bonded and braided polyurethane and nylon high pressure line which features a female luer lock and rotating male luer lock. With an overall length of 12 inches, this extension line can withstand pressures up to 1200 psi and provides flexibility while helping to simplify the design and prototyping phases of your project. Our sales team can assist you in building a custom configuration to meet your project requirements. Qosina offers an extensive line of pre-assembled extension lines available in a variety of configurations that are in stock and ready for immediate delivery. Qosina part # 36228 is a bonded and braided polyurethane and nylon high pressure line which features a female luer lock and rotating male luer lock. With an overall length of 20 inches, this extension line can withstand pressures up to 1200 psi and provides flexibility while helping to simplify the design and prototyping phases of your project. Our sales team can assist you in building a custom configuration to meet your project requirements. Qosina offers an extensive line of pre-assembled extension lines available in a variety of configurations that are in stock and ready for immediate delivery. Qosina part # 36230 is a bonded and braided polyurethane and nylon high pressure line which features a female luer lock and rotating male luer lock. With an overall length of 48 inches, this extension line can withstand pressures up to 1200 psi and provides flexibility while helping to simplify the design and prototyping phases of your project. Our sales team can assist you in building a custom configuration to meet your project requirements. Qosina offers an extensive line of pre-assembled extension lines available in a variety of configurations that are in stock and ready for immediate delivery. Qosina part # 36222 is a bonded and braided polyurethane and nylon high pressure line which features a female luer lock and male luer lock. With an overall length of 20 inches, this extension line can withstand pressures up to 1200 psi and provides flexibility while helping to simplify the design and prototyping phases of your project. Our sales team can assist you in building a custom configuration to meet your project requirements. Qosina offers an extensive line of pre-assembled extension lines available in a variety of configurations that are in stock and ready for immediate delivery. Qosina part # 36223 is a bonded and braided polyurethane and nylon high pressure line which features a female luer lock and male luer lock. With an overall length of 30 inches, this extension line can withstand pressures up to 1200 psi and provides flexibility while helping to simplify the design and prototyping phases of your project. Our sales team can assist you in building a custom configuration to meet your project requirements. Qosina offers an extensive line of pre-assembled extension lines available in a variety of configurations that are in stock and ready for immediate delivery. Qosina part # 36212 is a bonded and non-braided PVC high pressure line which features a female luer lock and rotating male luer lock. With an overall length of 6 inches, this extension line can withstand pressures up to 1000 psi and provides flexibility while helping to simplify the design and prototyping phases of your project. Our sales team can assist you in building a custom configuration to meet your project requirements. Qosina offers an extensive line of pre-assembled extension lines available in a variety of configurations that are in stock and ready for immediate delivery. 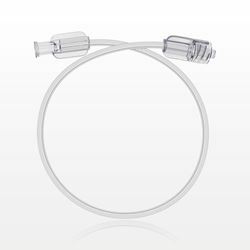 Qosina part # 36216 is a bonded and non-braided PVC high pressure line which features a female luer lock and male luer lock. With an overall length of 10 inches, this extension line can withstand pressures up to 1000 psi and provides flexibility while helping to simplify the design and prototyping phases of your project. Our sales team can assist you in building a custom configuration to meet your project requirements. Qosina offers an extensive line of pre-assembled extension lines available in a variety of configurations that are in stock and ready for immediate delivery. 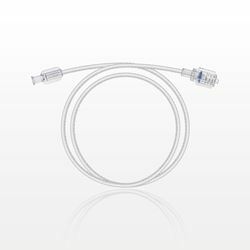 Qosina part # 36217 is a bonded and non-braided PVC high pressure line which features a female luer lock and male luer lock. With an overall length of 20 inches, this extension line can withstand pressures up to 1000 psi and provides flexibility while helping to simplify the design and prototyping phases of your project. Our sales team can assist you in building a custom configuration to meet your project requirements. Qosina offers an extensive line of pre-assembled extension lines available in a variety of configurations that are in stock and ready for immediate delivery. 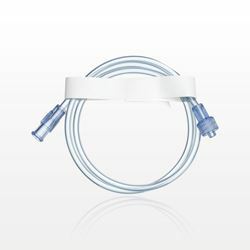 Qosina part # 36218 is a bonded and non-braided PVC high pressure line which features a female luer lock and male luer lock. With an overall length of 30 inches, this extension line can withstand pressures up to 1000 psi and provides flexibility while helping to simplify the design and prototyping phases of your project. Our sales team can assist you in building a custom configuration to meet your project requirements. Qosina offers an extensive line of pre-assembled extension lines available in a variety of configurations that are in stock and ready for immediate delivery. 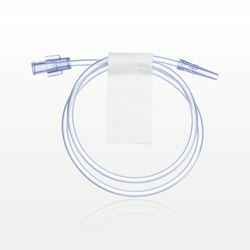 Qosina part # 36219 is a bonded and non-braided PVC high pressure line which features a female luer lock and male luer lock. With an overall length of 48 inches, this extension line can withstand pressures up to 1000 psi and provides flexibility while helping to simplify the design and prototyping phases of your project. Our sales team can assist you in building a custom configuration to meet your project requirements. Qosina offers an extensive line of pre-assembled extension lines available in a variety of configurations that are in stock and ready for immediate delivery. Qosina part # 36220 is a bonded and non-braided PVC high pressure line which features a female luer lock and rotating male luer lock. With an overall length of 20 inches, this extension line can withstand pressures up to 1000 psi and provides flexibility while helping to simplify the design and prototyping phases of your project. Our sales team can assist you in building a custom configuration to meet your project requirements. Qosina offers an extensive line of pre-assembled extension lines available in a variety of configurations that are in stock and ready for immediate delivery. Qosina part # 36221 is a bonded and non-braided PVC high pressure line which features a female luer lock and rotating male luer lock. With an overall length of 48 inches, this extension line can withstand pressures up to 1000 psi and provides flexibility while helping to simplify the design and prototyping phases of your project. Our sales team can assist you in building a custom configuration to meet your project requirements. Qosina offers an extensive line of pre-assembled extension lines available in a variety of configurations that are in stock and ready for immediate delivery. 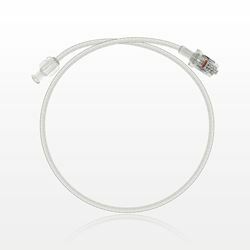 Qosina part # 36213 is a bonded PVC pressure monitoring extension line which features a female luer lock and male luer lock. With an overall length of 12 inches, this extension line can withstand pressures up to 100 psi and provides flexibility while helping to simplify the design and prototyping phases of your project. Our sales team can assist you in building a custom configuration to meet your project requirements. Qosina offers an extensive line of pre-assembled extension lines available in a variety of configurations that are in stock and ready for immediate delivery. 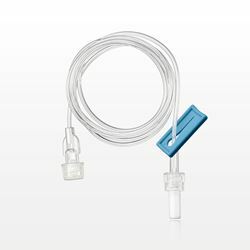 Qosina part # 36214 is a bonded PVC pressure monitoring extension line which features a female luer lock and male luer lock. With an overall length of 36 inches, this extension line can withstand pressures up to 100 psi and provides flexibility while helping to simplify the design and prototyping phases of your project. Our sales team can assist you in building a custom configuration to meet your project requirements. Qosina offers an extensive line of pre-assembled extension lines available in a variety of configurations that are in stock and ready for immediate delivery. 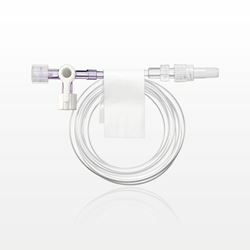 Qosina part # 36215 is a bonded PVC pressure monitoring extension line which features a female luer lock and male luer lock. 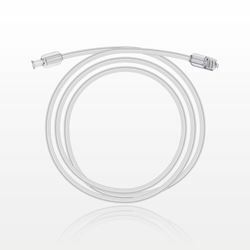 With an overall length of 60 inches, this extension line can withstand pressures up to 100 psi and provides flexibility while helping to simplify the design and prototyping phases of your project. Our sales team can assist you in building a custom configuration to meet your project requirements. Qosina offers an extensive line of pre-assembled extension lines available in a variety of configurations that are in stock and ready for immediate delivery. Qosina part # 33061 features a female luer lock on one tube end and a male luer lock connector on the other. Made in PVC, this extension line has an overall length of 20 inches and is pre-coiled and taped for easy handling. Extension lines provide flexibility while helping to simplify the design and prototyping phases of your project. Our sales team can assist you in building a custom configuration to meet your project requirements. Qosina offers an extensive line of pre-assembled extension lines available in a variety of configurations that are in stock and ready for immediate delivery. Qosina part # 17648 is a mini-bore extension line which features a female luer lock on one tube end and a male luer lock connector on the other. 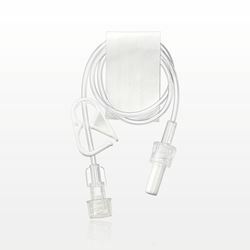 Equipped with a slide clamp and non-vented caps, this extension line has an overall length of 6 inches and provides flexibility while helping to simplify the design and prototyping phases of your project. Our sales team can assist you in building a custom configuration to meet your project requirements. Qosina offers an extensive line of pre-assembled extension lines available in a variety of configurations that are in stock and ready for immediate delivery. 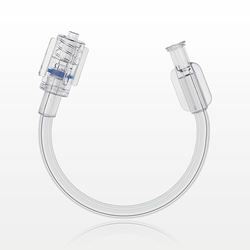 Qosina part # 33062 features a female luer lock on one tube end and a male luer slip connector on the other. Made in PVC, this extension line has an overall length of 20 inches and is pre-coiled and taped for easy handling. 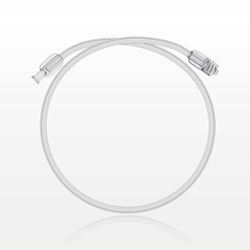 Extension lines provide flexibility while helping to simplify the design and prototyping phases of your project. Our sales team can assist you in building a custom configuration to meet your project requirements.